Carter Family Comics: Don't Forget This Blog! 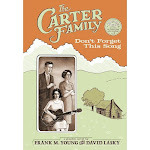 : Take a look inside our new Carter Family graphic novel! Take a look inside our new Carter Family graphic novel! "Don't Forget This Song" Preview from James Gill on Vimeo.